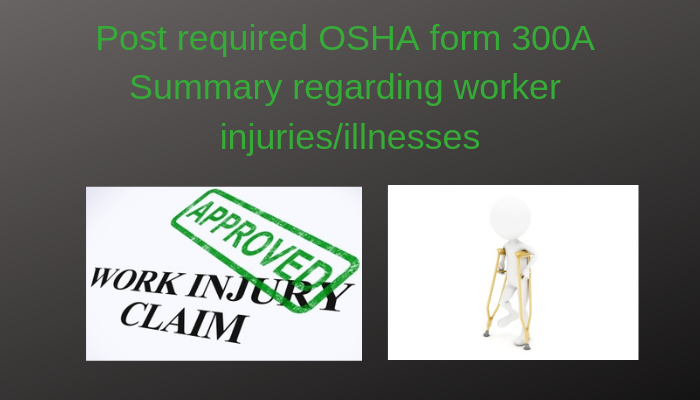 The Occupational Safety and Health Administration (OSHA) requires employers to post Form 300A, the Annual Summary of Job-Related Injuries and Illnesses, in a workplace common area by Feb. 1. This document reports the total number of fatalities, missed workdays, job transfers or restrictions, and injuries and illnesses in the business for the previous year as recorded on Form 300, the Injury and Illness Log. This official must certify that he or she has reviewed the related records and that the posted summary is accurate and complete, to the best of his or her knowledge. Post the summary in a common area where notices to employees usually are displayed. A copy of the summary must be made available to employees who move from worksite to worksite or who do not report to any fixed establishment on a regular basis. Who Must and What Should Be Reported? If you have more than 10 employees and are not exempt, you must track injuries and illnesses. Certain low-hazard industries are exempt. Businesses that employ fewer than 10 workers or those that fall into an exempt category must also record injuries if they are required to by OSHA or the Department of Labor’s Bureau of Labor Statistics for survey purposes. Generally, only serious injuries resulting from workplace activity must be reported which include those resulting in a fatality, loss of consciousness, days away from work, a restricted work schedule or job transfer, or a significant injury or illness diagnosis by a health care provider, or that requires medical treatment beyond basic first aid. The 300A summary must be posted at each job site from Feb. 1 to April 30.